Your new movie Subject 0: Shattered Memories - in a few words, what is it about? It is a movie thriller with elements of horror and science fiction. The technology is shown in an extreme way: common appliances such as television, radio and especially mobile phone can induce subliminal messages to people and get them to make certain choices and actions. The characters live different stories that intertwine with each other, forming a unique and complex story that requires more than a single view to be better understood. Every single word connects the viewer to broader and complex concepts as well as the feelings of the characters, all more faithful to real life than to a complex world. Intrigue, murder, and betrayal are the surface atmosphere that you breathe during the movie, but not only, there is a slight use of irony and sarcasm in each scene to create more tension and never to get the viewer bored. Subject 0: Shattered Memories is not just a movie thriller, it is so much more. What were your inspirations when writing Subject 0: Shattered Memories? And what can you tell us about your writing partners, and what was your collaboration like? Writing with Roberto Del Piccolo [Roberto Del Piccolo interview - click here] and David White was really very easy and fun, we all have the same taste in films and we like to write stories with big issues and not only about social life. We were inspired by thriller and horror movies, but we wanted to create something new, so we took inspiration also from science fiction and drama. It 'was very interesting to create the feelings of the characters because we took inspiration from real people and real situations, the characters are very realistic living stories very intertwined and never dull, rich in twists. Subject 0: Shattered Memories is very complex in its narrative - so did you ever run the risk of losing yourself in the story? Sure, and we often lost ourself when writing. We rewrote the script several times to make it closer to reality whilst fulfilling the basic elements of science fiction and comedy. It was a hard work but satisfying. Unfortunately it is not easy to create stories that get the viewer glued to the screen, but we have succeeded. In Subject 0: Shattered Memories I wanted the direction to be very academic and clean. I combined the style of American cinema and Italian cinema. I did not want to imitate American cinema nor impose Italian cinema because my goal is the union of styles. I am looking for the perfect movie, but not qualitatively or technically, for me the perfect movie is the movie that appeals to everyone. I'm for the cultural, racial and sexual union. For me, the world must stand together and not separate, must be a place where all live together and share their knowledge and experience in mutual respect. And this my world view is reflected in everything I do. Especially in films. You also play one of the lead characters in the movie - so what did you draw upon to bring Joshua to life, and how much of Tiziano Cella can we find in Joshua? And did you write the character with yourself in mind? Joshua and Tiziano Cella are two different people, they have nothing in common. When I play or I create a character I do not change my soul to become that character and I don't draw inspiration from my life experience. I am that character. I have another soul within me. What I do is just go from one soul to another. I know what he eats, his loves and passions, I also know how he goes to the bathroom. I am that character. For me, an actor should not imitate or rebuild a character, He must be the character at 100%. If he does not, the character is not very fluid, is fake. An actor should never lie. It must always be sincere. The actors that I have chosen are all very good, it's really difficult to say who is the best player. I have chosen them for their skills, but not only. When I choose actors for my films in addition to the acting quality I also care about their passion for this job. The actor I choose must love the job and has to love the character, must become the character. Also outside of the film set (s)he has to be a friend, a person whom you can trust and who can be counted on. An actor is not just a puppet, is above all a person. During filming you should always laugh. Everyone involved in a film must all be cheerful and happy. They need to share their ideas on every scene of the film, I always want to listen to all opinions and ideas before shouting "action!" I do not like to make decisions as if I were a dictator. A film is a team effort where everyone must be able to express their ideas. It will be the director to make the final decision, always and only the director, but after listening to everyone. The silence and seriousness should only exist in that time frame between the words action and cut. Subject 0: Shattered Memories was shown privately to people who know the film industry and people who do not know it at all. Projections have been very small in order to understand if the film works, or should be changed. In all the projections almost everyone left the room very pleased with the film. Yes, I'm writing a new film, horror fantasy, the script is almost ready and I hope to find a production company interested in producing it. For now I can not say any more. Myself, I decided that filmaking is my life when I was a teenager and I had to carry all my projects. Obviously I have studied and continue to study film, I graduated in history and criticism of film and I worked in many departments. But this is a job where you have to study more and more day by day. You eventually branched out into acting as well - how did that happen, and how do directing and acting compare/complement one another, actually? Actually I do not even know how it happened. One day I found myself acting in a short film for fun and from there I have not stopped, and in the meantime I studied as a director. So today I'm a director and actor, I like to do both and it is very useful because I can understand the difficulties of an actor when I make a film, and the difficulties of a director when I play a character. What can you tell us about your filmwork prior to Subject 0: Shattered Memories, in whatever position? 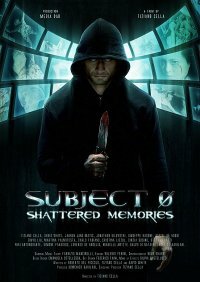 Subject 0: Shattered Memories is my first feature film as a director. In 2010 I shot my first short film Damned Cuba, a little work. In 2011 I directed another short film Imago Vocis, more complex, and in 2013 Temple Mount, my last short film that was very successful. A comedy, a thriller and a sci-fi movie. Then after some works as an actor comes a starring role in Doll Syndrome directed by Domiziano Cristopharo. Now Subject 0: Shattered Memories, where I'm both actor and director. Each work I made is always better than the past one, so I grow day by day. How would you describe yourself as a director and as an actor? I am a director and an actor out of the ordinary. The directors are often seen as too authoritarian people that no one should contradict while the actors feel like queens who are never wrong. I am however a very humble person and I always listen to those around. But most I assume my responsibilities and I admit my mistakes and weaknesses. There are so many talented directors and actors who choose only a few in particular is really difficult. I try to take a cue from most artists possible. One very important thing is to take inspiration also from new and emerging artists, not only from the most famous. Each artist has an element to be transmitted and if I can I take inspiration for my work. Your favourite movies ... and of course, films you really deplore? Choose a movie as my favorite or most hated is really hard. Each film, be it a masterpiece or a tremendous flop, has always an element that fascinates. There is always more to learn. Films are dreams, and as such are unique. My personal website is www.tizianocella.com while my official Facebook page is https://www.facebook.com/TizianoCellaOfficialPage where there are updates on my projects. The official page of the film Subject 0: Shattered Memories is https://www.facebook.com/subject0. With these sites people can follow all the news about the film, my professional life, and contact me directly. You made up some very intelligent and interesting questions, we analyzed the film and talked about me, I really enjoyed that and I hope in the future we can do another interview together. Thank you!